Many residents of McLean Gardens have found that participation on a committee has helped them get to know their neighbors and enjoy our lively community spirit. Each committee is chaired by a unit owner, confirmed by the Board of Directors. The size of the committees ranges from about five to more than fifteen members and levels of activity differ for each committee. The Activities Committee organizes social functions for McLean Gardens residents. Current activities include spring and fall lawn sales, a summer pool party, a July 4th celebration, and an end-of-the-year holiday celebration. The committee also works with community parents to plan occasional seasonal functions for the children of McLean Gardens such as a Halloween party. And as opportunities present themselves, the committee sponsors additional community events such as book talks, art exhibits, jazz on the lawn concerts, or presentations on McLean Gardens history. The Communications Committee represents and assists in meeting the communication needs of owners, residents, the association Board and committees, management, and other community constituencies. The committee also publishes annually six to 10 issues of The McLean Gardens Update. Mandated by the McLean Gardens Condominium Association Bylaws and appointed for two-year terms by the Board of Directors, the five-member Covenants Committee, composed of unit owners, interprets and enforces the Bylaws, Rules, and Regulations of the Association. The committee meets regularly to act on (1) unit owners’ required requests for alterations in their units and (2) violations of Association Rules. The Facilities Committee works with Management to formulate recommendations to the Board of Directors for many of the condominium’s common elements such as the entry halls and stairways, signage, exterior lighting, walkways, barbecue areas, outdoor benches, parking lots, roofs, and the like. An important part of the committee’s responsibility is to solicit the views of residents on such matters and factor these perspectives into the committee’s recommendations. The Finance Committee works with Management and the Treasurer to manage the fiscal health of the community. Its responsibilities include reviewing the annual audit and investment strategies; making appropriate recommendations to the Board of Directors; assisting management with the preparation of the annual budget; and reviewing the monthly financial reports and such items as the annual draft audit and annual insurance policy renewals. The grounds that make up our community enhance our quality of life and are an important asset that must be maintained properly. The grounds also increase the values of our homes by distinguishing us from other condominiums in our urban setting. 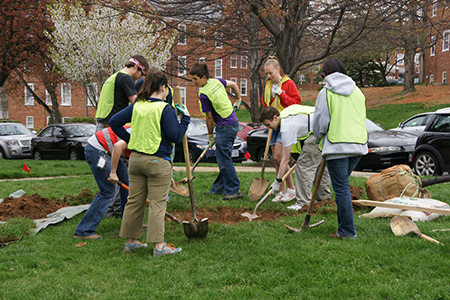 The Landscape Committee seeks to revitalize the grounds of our community by developing and restoring our lawns and plantings to a healthy state. 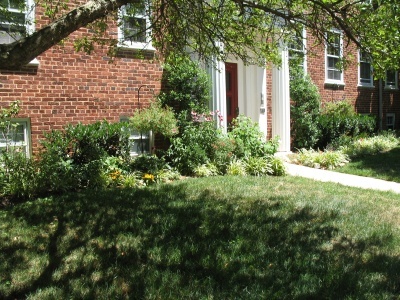 The Committee will also design and recommend a plan for doorway landscaping. The Committee will help identify pest problems and recommend a course of treatment to the Board. The Pets Committee works on managing pet issues and strives to keep McLean Gardens friendly and safe for all. The committee monitors District wide pet issues and makes recommendations to the Board of Directors on matters regarding pets on the McLean Gardens campus. The Pool Committee works to improve pool maintenance and service. It also cooperates with management in reviewing the annual contract for the pool service and makes recommendations to the Board of Directors as appropriate. The Sustainability Committee advises the Board of Directors and other standing committees on issues of environmental sustainability, with the goal of helping McLean Gardens to be a sustainable community that uses natural and economic resources wisely while working to improve the environmental, social, and economic well-being of all. The Windows Committee works with Management to make recommendations to the Board about future work on the windows in all 31 residential buildings.